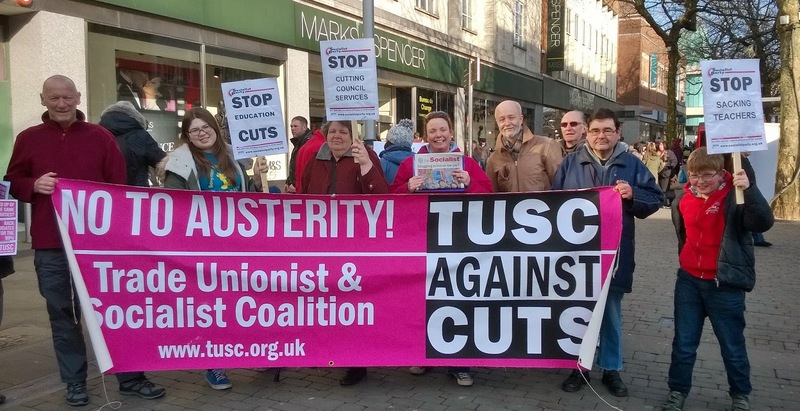 Swansea Trade Unionist and Socialist Coalition (TUSC): Listen to the people! That’s the message Swansea TUSC will be taking to the lobby of the Special Cabinet Meeting of the Council, Tuesday (10 February) from 4pm at the Civic Centre. For any Labour councillors willing to listen, the Swansea Trades Unionist & Socialist Coalition (TUSC) street ballot today (7-2-2015) sent a clear message: The people of Swansea want their representatives to stop voting for Tory cuts and start fighting them. 188 people participated in our ballot. Not one of them wanted their Labour councillors to make Tory cuts; 100% of them voted that they want “representatives who will fight the cuts”. Unfortunately it appears that they won’t get that from their elected Labour representatives. Just like in the run-up to last year’s cuts budget, not one Labour councillor has spoken out against, let alone indicated a willingness to vote against, projected cuts of £80 million+ over the next 3 years. The only defence they can offer for their failure to fight Con-Dem cuts is to claim that it is better that they make the cuts than somebody else does. People we spoke to today were furious that all Labour councillors are getting paid to vote for £millions of cuts to our jobs and services. We asked people we balloted which of the proposed cuts that will be considered by Swansea’s Special Cabinet Meeting next week, most concerned them and invited them to write down a message to send to Swansea councillors. There are a whole range of proposals that are worrying people we spoke to and making them angry, including the outsourcing and cuts in leisure and social services, threats to close youth centres and Plantasia, increases in charges for a number of council services and cuts in funding for supported organisations like West Glamorgan Youth Theatre. Time and again though, the issue that seemed to most anger people is the proposed cuts to education. That’s no surprise; many had read the report in the local paper predicting that primary-age pupils could end up being taught in classes of 40 if these cuts to funding go ahead. In fact a number of heads of primary schools, including the one my youngest son attends, have predicted to the Council that 15% reduction in funding being proposed over the next 3 years could lead to classes of 42+ for some primary school pupils. That’s what Swansea TUSC supporters will be demanding when we join the lobby of the Council Special Cabinet Meeting on Tuesday, from 4pm, Civic Centre.